"Last night a young man sat down and started chatting with me. The conversation soon turned into talking about the years he spent in the Army. I then briefly mentioned working with Soldiers' Angels. This young mans face lit up with a huge smile as he expressed his great appreciation for Soldiers' Angels. He said the Angels don't realize how meaningful the care packages are to the troops. He explained how he had to go several weeks without a shower and receiving something as small as a little pack of baby wipes was like a piece of heaven. 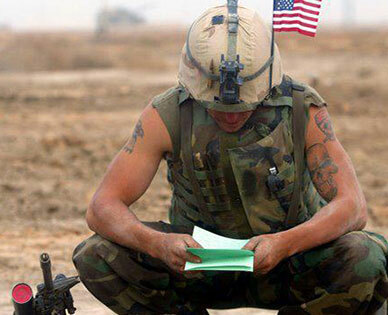 He said he received several care packages throughout his years of service and to this day still has all of the handmade cards received from children. I felt I should share this story so that everyone involved with Soldiers' Angels will see the hard work, dedication, unselfish acts of kindness, and love you put into Soldiers' Angels is greatly appreciated by the troops!"